The seller of today’s Nice Price or Crack Pipe Mercedes has based its price partially on his desire to fund another purchase, that of a Ferrari Testarossa. That’s perhaps not the best arbitrator of value, but then, wait ’til you see this Benz. Howard Hughes supposedly collected, among other personal intimates, jar upon jar of his own urine. For what reason, we don’t precisely know, perhaps it was in the hope that Sasha Grey would eventually show up? Collecting undesirable things doesn’t always have to be a rich man’s sport, as proven by yesterday’s time capsule 1978 Chevy Chevette. Unfortunately for its Canadian seller, fully 64% of you felt its price was too rich for your blood. 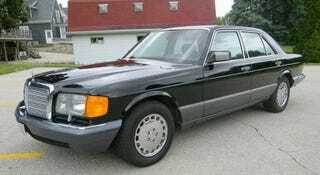 Speaking of the rich, they are who you might most commonly find behind the wheel of classy rides like today’s 1991 Mercedes Benz 350SD, valets and car thieves not withstanding. The W126 Benz had a remarkably long production run, debuting in 1979 and sticking around until being replaced by the W140 more than a decade later. These top of the line sedans were dubbed the Sonderklasse, which in German means or special class. That of course means something different here in the States - a place in school where you put the slow kids. There’s nothing slow about this big diesel Benz, in fact the seller touts getting speeding tickets in it! It should be noted that the 1990-91 350SD is not powered by the venerated OM617 3-litre five cylinder, an engine that will likely join cockroaches, Kanye’s ego, and Bengazi investigations in surviving the apocalypse. Instead, these cars - 2,066 U.S. production - offer the OM603, a 3,449-cc SOHC six cylinder that with a turbo produces 136-bhp and 228 lb-ft of torque. The 3.5-litre six is also known for suffering head gasket issues as well as cracked heads on the American editions. Those problems tended to show up early, and as this 350SD has an amazing 222,000 miles on the clock, it’s likely that the mill will keep on keepin’ on. I say that those miles are amazing because the car looks to be in remarkable condition for having gone that distance. The bodywork appearing immaculate in both its conception and presentation, with all its trim equally intact. The pics have it running on a set of chrome 15-slots, but the ad says it’s presently on factory wheels, which should be... 15 slots? The interior, made from what looks to be the leather of only the most angelic of cows, seems far too nice for the car’s miles and years, and evidences none of that weird scrunching of the door pillar material or dash cracking that is typical of the age. The ad says the car is completely serviced and cross-country ready. There’s no rust, and it comes with its original stereo and an extra turbo in the trunk. That ad also apologizes for the price, which at $44,000 ain’t chicken feed, but explains that the current owner is seeking to buy a Testarossa and hence is looking to bank that form the sale of this big Benz. What do you think about his chances of that working out? Does this amazingly tidy W126 seem like it might be worth that kind of scratch? Or, at that price is the seller’s Ferrari goal a Benz too far? Old Milwaukee Craigslist, or go here if the ad disappears. H/T to Choirboy82 for the hookup!